Quadcopter racing is insanely fast. 50ms of latency is more than pilots can afford. I think Prosight HQ is fine for an Airplane, Flying Wing or a slow drone, but for a quadcopter racing it simply doesn’t work. Even the HP setting isn’t good enough for some pilots… But i think this is a matter of getting used to it. People that already fly analog will surely feel the difference of latency, but they will get used to it. I think that if FPV Racing pilots could have an 480p digital link with 25~30ms of latency, it’s already better than an analog link. Higher resolution is awesome, but they do not really need higher resolution… they just need the image clear and sharp all the times. To achieve that the solution must be end-to-end… Camera, Transmitter, Receiver and Display… All need to be made to interact with each other with minimal latency. The camera sensor must output video in the native display resolution, the transmitter must encode the video using fast codecs. Maybe uncompressed video is the key, but it’ll need lots of bandwidth. Maybe output only in black and white can allow uncompressed video broadcast. FYI The firmware update for Headplay reduces glass-to-glass, analog signal latency from ~60ms to 10-15ms. At or below 50ms, I doubt latency is a problem any more; for most applications. As Daniel pointed out, quadcopter racing might need lower latency, but that can be compensated by reducing quality (and use MIPI/CSI ?). But that’s just a niche application for digital fpv. For most cases, I believe the major issue is cost, then quality, range, and RF bandwidth, in that order. 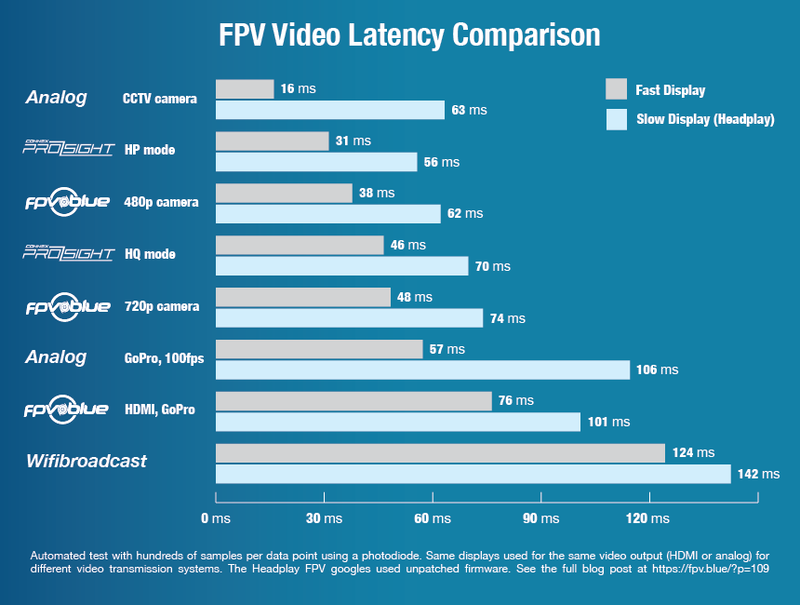 If fpv.blue manages to provide 1080p (or even 720p) and sell for ~200$, it will be a huge success. Really looking forward to future updates. hey, any updates on this system? Hey, the graph says “Fast display”/”Slow display”, what category would you put DJI Goggles, I believe its a slow display for sure, but is it slower than the Headplays?